Last Thursday was my middle sister Mary birthday and I made plans for a few friends and family to celebrate her day at Rooftop 866 which is adjacent to the Renaissance Hotel in Midtown Atlanta. 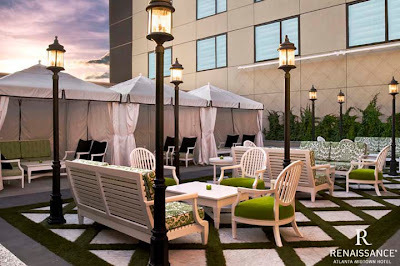 The nicely decorated Rooftop 866 is decorated by fire pits, contemporary seating areas and nice tables. I hear the crowd is always upbeat there, but it was kind of quiet and only a few people was there, but of course it was a Thursday evening. It was a perfect April evening to be on the rooftop with light wind blowing, overlooking the city enjoying tapas-style cuisine and drinks with the girls. The food and drinks was delicious what was even better was how reasonable priced the food and drinks were. If you are ever in the city looking for something to do or have guests in town and looking for somewhere to go, make sure to check out Rooftop 866, you will not be disappointed. Oh and while you are there try the Raspberry Lemonade-delish!